Removing pin rows…doh! It took me quite some time to figure out a working solution for this problem, so I thought it might be useful to you some day, too. Some idio^h^h^h^h not so clever person cut off all the pins on one of my DSM860 RAM boards – I probably will never figure out why (may a lightning hit him!). Besides 8 of the pins all other 74 (!) where cut, rendering the ram card non-functional (it’s the memory bus connector). I started to desolder some pins from the back-side of the card but soon found out that the solder was too old to be removed the classic way (desolder pump & wick). Also, that pin-row (41×2) was one piece, so I would have to completely remove all the solder before I would be able to pull the part from the card. First you need to cut away the plastic part from the top of the board. I used a very fine and sharp caliper to cut away one pin after the other (i.e. like a single jumper). While doing so be careful not to cut into the board! Then pull or push the plastic pieces from the pins, again one after the other – I used a thin knife pushed under the plastic an gently wiggling it over the pin. You may spot that some pins are missing already – that’s because my previous desolder tries sometimes seemed to work. Still, I couldn’t avoid that some pins got bent. 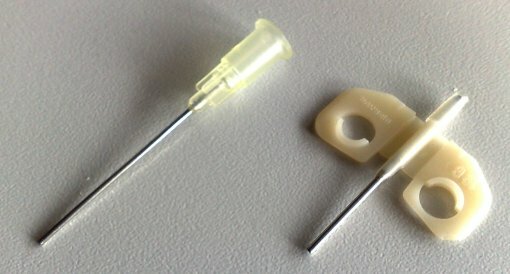 This is the time for my secret repair tools: Syringe needles! So straighten all the pins into an upright position. This will be important for the next step! Now put your board into a vertical position (e.g. fixed by a bench vise or clamped between your inner thighs ;-)), get out your solder iron and the G18 needle – this needle should be just small enough to fit through a pin-hole. From the other side you’re touching the base of the pin with your solder iron. As soon as the solder starts to melt gently push the needle onto the pin. If everything works like it did for me, you will push the needle through the board, including the solder and the pin you’ve planned to remove! The great thing with this is that the needle (being made of steel) does not stick to the solder. 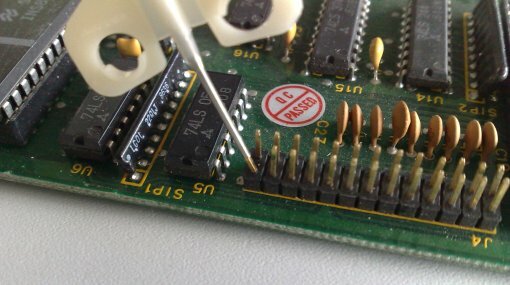 As soon as the needle got a bit colder, you can easily remove the pin as well as the excess solder from the needle with your fingers! Now carefully pull back the needle through the board and you should have a nice and clean through-hole in the board. If not, a final cleaning with a desolder-pump or wick should do it. This needle-trick also works brilliantly with empty pin-holes which got filled with solder. 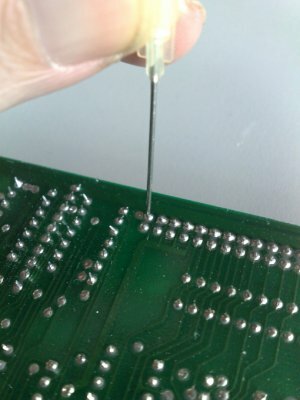 Just place the needle on the pin-hole on one side of the board, heat up the solder on the other side while pushing the needle. Pop! There goes the solder! As said, this technique worked great for me. All 82 pins got removed, a new pin-row was soldered into place and the card is now working like a charm. Still, do this at your own risk! I’m not going to be taken liable for any damage to your board or your health! If your unsure if you are able to perform this stunt, don’t do it! Practice with an old scrap board/card before you fiddle with the “real thing”!